To ensure that people in need make it on time to hospitals, Delhi Chief Minister Arvind Kejriwal has launched bike-ambulance services. The services have been rolled out on a pilot basis in East Delhi. Kejriwal said that this service would provide quick pre-hospital response in congested areas. “This is a big step in the health sector. Everybody knows that the Delhi government is doing good works in education and health sectors,” Kejriwal said, adding that it would also be good from the traffic point of view. 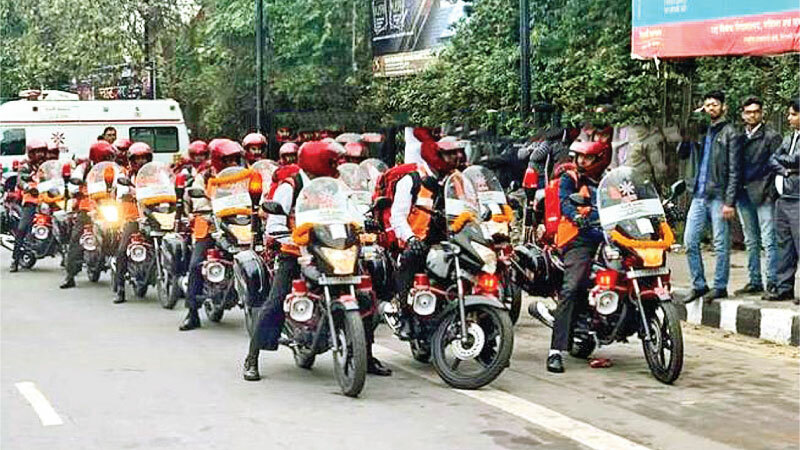 The Chief Minister flagged off 16 bike ambulances outside the Delhi Secretariat. Known as First Responder Vehicles, these bike ambulances will be equipped with a portable oxygen cylinder, first aid kit, air splints as well as GPS and communication device. The chief minister said four-wheeler ambulances had to face difficulty in entering narrow lanes. “If there’s a medical emergency in narrow bylanes, bike ambulance can go there and immediately provide its service to patients,” the minister said. Arvind Kejriwal also said that the number of bike ambulances would be increased in the coming days.